This is true one page checkout for VirtueMart. This is a MUST HAVE for VirtueMart. We believe this component makes VirtueMart a powerfull ecommerce solution and provides extended and needed functionality into the checkout process. As far as our customers say, it really raises your sales. For further information, please search for "one page checkout customer experience" on your favorite search engine. It has been tested and implemented on thousands of webpages and different countries (Netherlands, Germany, USA, Italy, Spain, UK, Sweden and many others) and is compatible with any known shipping method including UPS, USPS, FedEx, Standard Shipping, Shipping by Rules or any from extensions.virtuemart.net or 3rd party sites. For all the features please have a look at our demo sites here and feel free to make a test order. Installs as com_rupsearch and mod_virtuemart_ajax_search_pro. Since version 303 supports cusomized priority logic (you can decide which results are more relevant for you per seach in SKU, Product name, Description or a few others). The goal of our "Ajax Search Pro" is to provide the best possible search results for your shop. Page cache plugin for Virtuemart 3 that supports page cache per detected mobile device or Joomla language with a support for anonymous shopper groups set by OPC, installs with vm_cache and vm_cache_last plugins (requires 2 plugins to be run properly). You can now alter Order numbering in VM or Invoice numbering via OPC backend configuration. All time and date formats are supported. This plugin uses sophisticated logic to calculate Auto Increment values per your desired time periods. This component uses parts of source code from VirtueMart and is licenced under GNU/GPL license. For full license details please review this link (GPL). There is no limitation on per domain use, however we will appreciate in matter of extended support if you made more then one purchase. You pay for download subscription that is not automatically renewable and you can download our software during the subscription period from our download section. Subscription allows you the access to our dowload section for one year from the date of purchase, you will NOT get charged automatically after the end of your subscription. You must be logged in to our site to be able to use the download links. We release updates (feature updates, bug fixes, compatiblity fixes) every 2 weeks usually. You do not need to update our OPC that often, but it is strongly recommended to update once you do a general Virtuemart update since we never know what gets changed in future Virtuemart versions. All licences include one year updates (access to download section) for One Page checkout and our Extensions provided via single installer. You must be logged in to be able to download the latest version. You can use either email or your username to log in to our site. Included in price: One year subscription for OPC1 and OPC2 including support of max one hour of programming work. Email support, chat is also provided with no additional costs. Not included in the price: Installation, design modifications. Setting up virtuemart, configuring external components. Included in the price:Template modifications, VM hacks merge and anything you would like to have on the checkout page to make our component better and you to sell more for up to 4 hours of programing work. Please write us more information via request form about needed modifications. For any design changes, please send us your image before purchase to quote a price for the implementation. One Page Checkout was already implemented on many Joomla 3.x and Joomla 2.5.x sites. (running VM3 or VM2) Minimum version of php supported are the same as Joomla and Virtuemart minimum versions. We provide 3rd party compatibility support for no additional costs especially for payment or shipping methods. 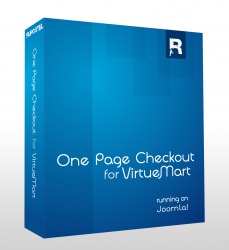 One Page Checkout 1 on Virtuemart 1.1.x is still supported but with long delayes on support responses - it may take up to 1 week to fix your issue on Virtuemart 1. We try to do our best in providing support in implementing our solution to your site. Refunds can be provided up to 14 days from the purchase. We usually require FTP access to fix small issues found on your site. If you would like to try our solution before purchase, please write us an email to info@rupostel.com. OPC automatically fixes a few known fatal errors found in the old versions of Virtuemart which were reported by our team, OPC also checks for DB structure known problems so it fixes common problems that usually come from various migration applications. The checkout loads via plugin loader which makes sure that it's loaded only where it's needed. Our goal is to provide a solution compatible with ALL versions of Virtuemart instead of just the very latest. improving this excellent module pls! !